Our Mission: NYC Service promotes volunteerism, engages New Yorkers in service, builds volunteer capacity and mobilizes the power of volunteers and national service members to impact New York City’s greatest needs. Our Vision: Inspire and empower New Yorkers to serve each other through New York City’s nonprofits, businesses, and city agencies. Opportunity: We seek to expand accessibility, engagement, and capacity for all to serve and be served. Integrity: We pledge transparency, openness, and honesty in all we do and in all our partnerships. Impact: We measure the effectiveness, outcomes and two-way benefits of volunteerism and national service programs, for individuals, neighborhoods, and organizations. efficiently and effectively through engaged volunteers and service year members, and the resultant ability to serve more New Yorkers. Civic Engagement is a key element of OneNYC and our City’s vision of growth, equity, sustainability, and resiliency. A key measure of civic engagement within One NYC is the NYC Service goal to increase the city’s volunteer rate to the 25% national average, as measured by the new 2017 U.S. Census Household Survey and a new citywide NYC Service civic engagement and volunteer survey and measurement. NYC Service, a division of the Office of the Mayor, launched in April 2009 in response to President Barack Obama's national call for volunteerism and a goal of engaging 100 million Americans in service by 2020. 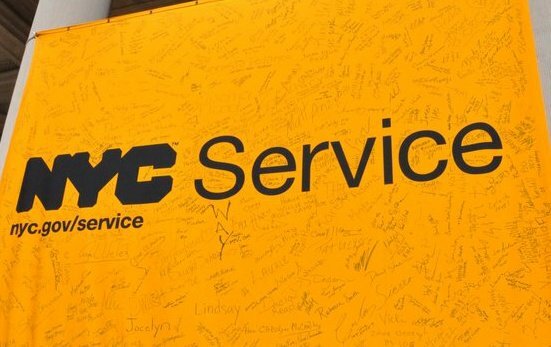 New York City was the first “City of Service” and since NYC Service launched, over 200 U.S. cities have joined the Cities of Service network.